In Azerbaijan only in one city, in Baku there are metro stations. Baku is big city, about 3 million of population living here. Transportation system is developing year by year. Other cities of Azerbaijan not so crowded. 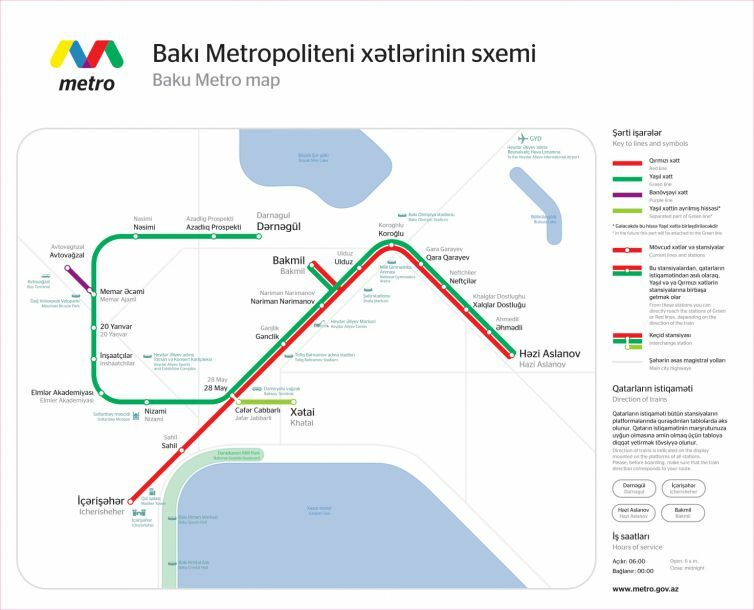 That`s why only in Baku we can see metro system. Metro prices is eligible here. You need to pay for entrance 0.30 manat and the distance of places is does not matter how far or near. The payment is just for entrance. On our "How to use public transport in Baku" blog post we explained about overall transportation system of Baku. So, for using Baku metro you need to take temporary or permanent Baku Cards. You can take them from kiosks which are locating at every metro station. It is operating in 3 languages: Azerbaijani, Russian and English. So choose appropriate language for you and select what you need. For permanent card you need to pay additional 2 manat per card. But for temporary one you do not need to pay additional. You will pay just for entrances. As a tourist, mainly you will need red line. The last stations which is "İçərişəhər" is the place where Old City located. Previous station of "İçərişəhər" is Sahil. Sahil is near to Nizami street or Tarqovy and to the National Boulevard. 28 May station is the main city hub. There are locating Railway Stations to other cities, 28 Mall and there you can change the line to the green line. Baku Metro operating both in Azerbaijani and English. So all sign boards are on both language and speaker too. For any assistance do not hesitate to ask a question from locals. Maybe they will not understand your language. But just tell them the name of location where you wanna go, or show them by map and they will be happy to assist you.